FCAL members and guests enjoyed an informative and very interesting program at the 2016 Annual FCAL Meeting,Banquet and Program. Christopher Cold shared 300 slides featuring Wisconsin wildlife and wildlife habitat along with some live “critters” which concluded his presentation. There were approximately 70 people in attendance at TBob’s in Laona for this event. Christian W. Cold is a wildlife technician for the Wisconsin Department of Natural Resources, Bureau of Wildlife Management. Based at Ladysmith, he also serves as a mobile, non-formal educator, who travels extensively throughout Wisconsin offering programs on wildlife and related topics of natural history to schools and adult audiences. His presentations typically include the display and interpretation of live, native animals which he maintains for this purpose. Mr. Cold is a 1991 graduate of UW-Stevens Point, with a Bachelor of Science in Natural Resource Management & Wildlife, with an emphasis in Environmental Education. 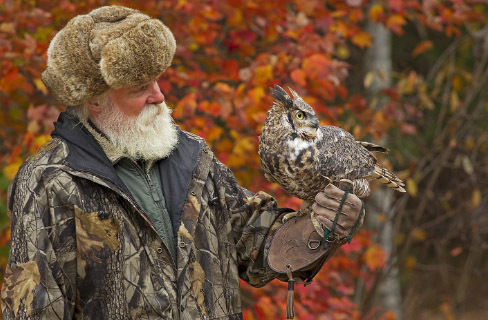 He is a licensed falconer (since 1970) and former bird bander (28 years). In his spare time he maintains a fleet of educational animals, takes nature hikes, hunts, fishes, wades & snorkels in area streams, reads natural history, and collects fossils, insects and other natural history objects. He lives near the Flambeau River with his wife Susan.